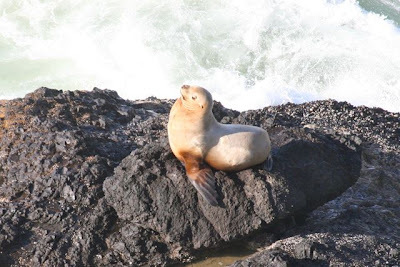 One of our stops along the Oregon Coast was the Sea Lion Caves just north of Florence. 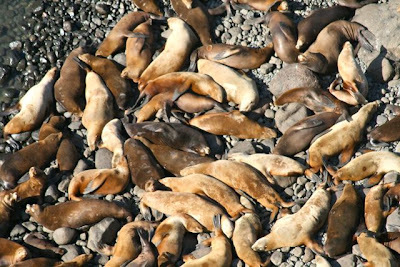 Most of the animals are of the variety called Steller Sea Lions, a non-migratory breed that lives in the area year-round. 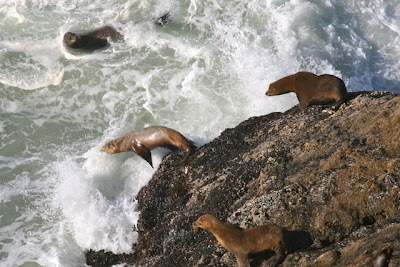 The pups, usually born in late spring and early summer, weigh 40 to 50 pounds at birth and the males can grown to 12 feet and 1,500 pounds. 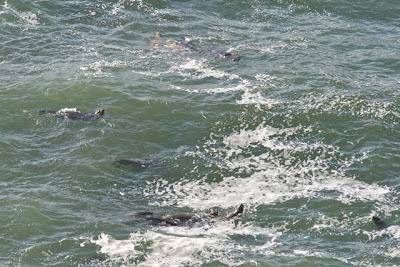 The females are slimmer and average 8 and 9 feet in length and perhaps 700 pounds. 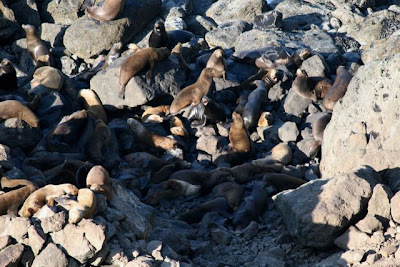 The Steller Sea Lion usually resides on offshore islands - the caves are its only known mainland habitat on the West Coast - and the world population is estimated at 250,000. 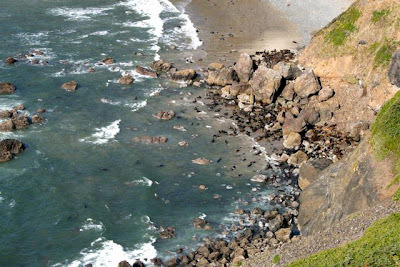 An estimated 200 usually reside in the caves, but that number can fluctuate with weather conditions and season. 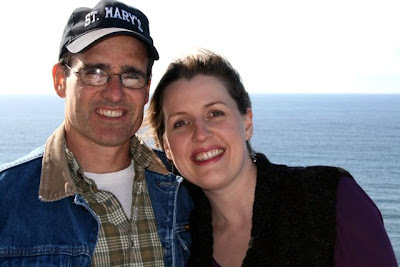 A sweet woman was willing to take a picture of the two of us to add to our Our Wedding Anniversary Memory Book . 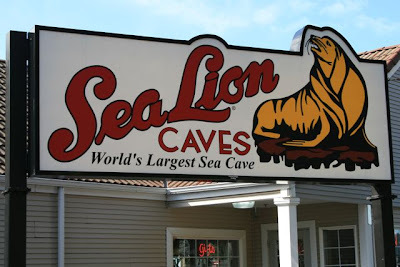 Since the Sea Lions were not in the cave during our visit, we decided not to purchase tickets to go down the elevator just to see an empty cave. 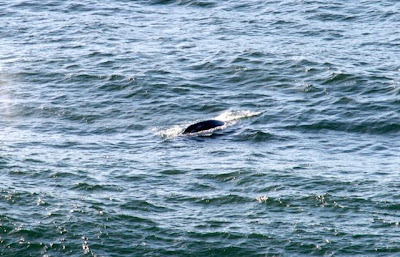 However, we did spot a Gray Whale from the gift shop window! 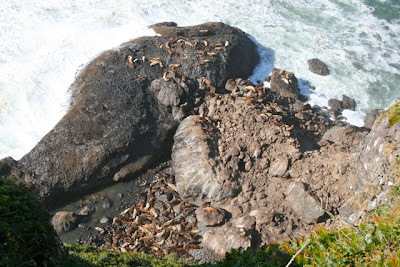 We then headed just up the road and stopped at another view point to see if we could spot the Sea Lions. There were hundreds!! While I was taking a "few" pictures hubby took a few short video clips with our little camera. *I hope your not all sick of me posting pictures yet... I still have quite a few I would like to share. 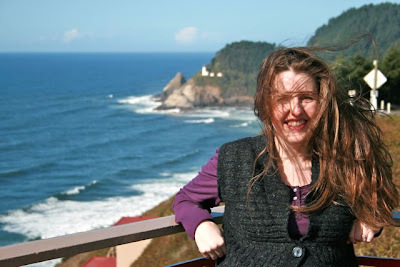 There was so much to see along the Oregon Coast! These pictures are awesome!!! Thanks so much for sharing. I'm glad you had a Happy Anniversary. What a nice anniversary!! God bless you. That's amazing!!! Y'all make such a cute couple. I love the pictures. And to several other places on your other posts. 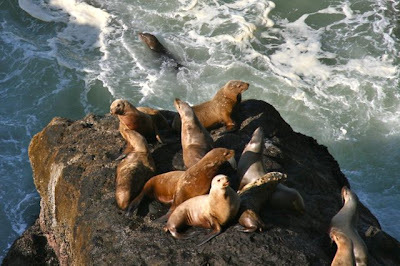 We thought paying to go down and see the sea lions was sort of spendy for what it was . . . so no loss there I guess. These are fantastic pictures. 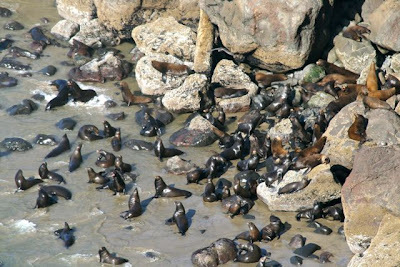 I come from Cornwall in the UK and there are boat trips to "Seal Island " from a place called St Ives but you don't always get to see the seals. I love that picture of you two! Beautiful!